The Motorola manufactured phone from Google, the Nexus 6 has had its prices cut in India. The price cuts do not appear to be official, as the Google Store still lists the phones at their launch prices. The Mountain View Company’s flagship device, was originally launched for Rs. 44,999 and Rs. 49,999 for the 32GB and 64GB variants. 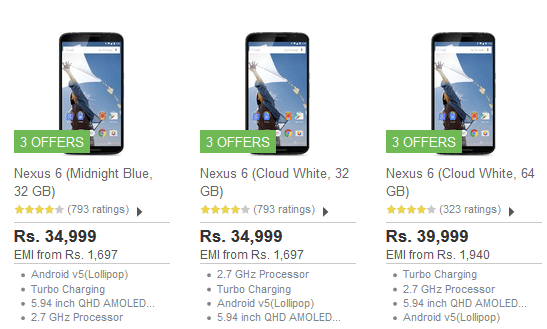 The prices of both variants of the Nexus 6 has dropped by Rs. 10,000. 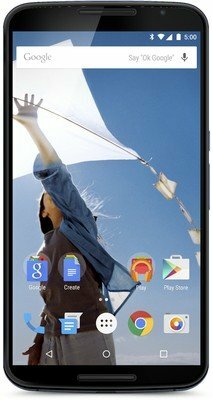 The Nexus6 32GB is available for Rs. 34,999 and the Nexus 6 64GB is available for Rs. 39,999. But that’s not all, you can get a further Rs. 5,000 off the price of the Nexus 6, by exchanging your old phone at Flipkart. That brings the prices of the two storage variants down to Rs. 29,999 and Rs. 34,999.